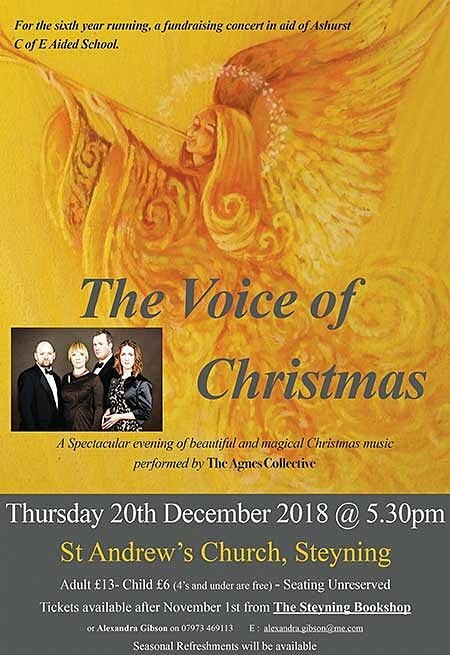 St Andrews Church Steyning: The Voice of Christmas. For the sixth year running. a fundraising concert in aid of Ashurst C of E Aided School. A Special evening of beautiful and magical! Christmas music performed by The Agnes Collective. Adult £13 - Child £6 (4’s and under are free). Seating Unreserved. Seasonal Refreshments will be available.